BCG Systems provides infrastructure, development, and business IT solutions for small to medium-sized businesses. When one of BCG’s clients, a Georgia-based company specializing in recreational and sporting goods, needed to upgrade their Microsoft Dynamics™ GP software, transition their on-premise production infrastructure to the cloud, and improve their backup solutions. They looked to BCG for help. In turn, BCG partnered with AwesomeCloud to provide their client with secure and scalable cloud infrastructure services. 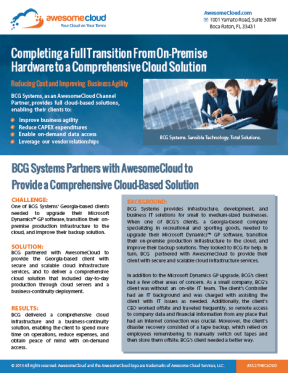 The following cloud computing case study reviews how BCG Systems delivered a comprehensive cloud-based solution to one of their clients by collaborating with AwesomeCloud. In addition to the Microsoft Dynamics GP upgrade, BCG’s client had a few other areas of concern. As a small company, BCG’s client was without an on-site IT team. The client’s Controller had an IT background and was charged with assisting the client with IT issues as needed. Additionally, the client’s CEO worked off-site and traveled frequently, so remote access to data and financial information from any place that had an Internet connection was crucial. Moreover, the client’s disaster recovery consisted of a tape backup, which relied on employees remembering to manually switch out tapes and then store them off-site. BCG’s client needed to find a better way. The entire upgrade was built from scratch at AwesomeCloud. Since BCG’s client is a small company and doesn’t have a very complicated setup, it made more sense to start from scratch and then migrate the data. BCG used a SSL VPN solution, supplied by AwesomeCloud, to provide their client’s CEO with anywhere access to the company’s systems. BCG installed a new Active Directory server, a new SQL Server, and a new remote desktop server, including a firewall, VLAN for multiple VPN users, and a site-to-site VPN. BCG upgraded their client’s Microsoft Dynamics™ GP software and downloaded databases from the on-premise servers to AwesomeCloud, which successfully completed the upgrade into the cloud. By leveraging Microsoft’s Cloud OS options, BCG was able to meet the needs of their client in ways that would not have been possible with an on-premise or self-hosted solution. BCG was able assure their client that their cloud-based solution complied with necessary financial regulations and certifications, including SSAE16. BCG delivered a comprehensive cloud infrastructure and business continuity solution, enabling their client to spend more time on their operations, reduce their short and long term expenses, and provide peace of mind with on-demand access. Business Agility: Prior to the transition to the cloud, the Georgia based company’s controller spent two to three hours, daily, on routine IT tasks. After transitioning to the cloud, the controller was finally able to dedicate all of his time to financial and operational issues, instead of splitting his time between core responsibilities and IT tasks. Reduced CAPEX: By leveraging a full cloud solution, BCG’s client avoided an upfront capital expense of approximately $30k. Instead, they pay a monthly fee, which amounts to an annual savings of approximately 40%. Performance Improvements: By moving to the cloud, BCG’s client benefits from the latest hardware, ongoing performance improvements, Microsoft innovation, cutting-edge releases, and the latest security upgrades. On-Demand Access: The client’s upgrade and migration to the cloud provides a solid business-continuity solution, allowing availability from anywhere with an Internet connection. With the comfort of knowing that their files are always available, BCG’s client can easily ask their employees to work remotely in the event of Internet loss at the office. If you’re interested in learning more about how AwesomeCloud can help your technology company deliver cloud-based solutions to your clients, please contact us for more information.